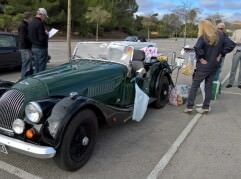 Seventeen cars met just outside Manacor for the start of the Mountain Climbers Rally organized by Jean Pierre Alleman. Tea/coffee and fresh croissants were supplied by Sue to ensure a good start was had by all. After a rally briefing by JP the cars were sent off in one minute intervals on a route that took them through the North East of the Island. Answers to clues were gathered along the way and after going through Arta, the mountain road up to the Ermita De Betlem was taken to the ” Font De S’Ermita.” Here there was a break and a short walk to cross a small stream to sample 3 spirits and to answer three questions as to what they were and what they were made from. The journey down to Arta provided some fantastic views over the Bay of Alcudia and our next stop was at a Poligono where a driving test was arranged. The idea being that whilst the driver navigated a small slalom course the co-driver held a spoon which carried an egg! The driver had to then stop the car at an equidistant between two bollards, where points would be deducted for any inaccuracies. Next came a mini version of Boules where both driver & co-driver had to get as near to the jack as possible and their combined distance was added together, all very testing trials! 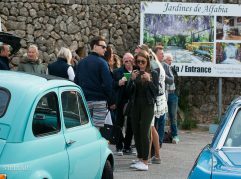 The final part of the rally took us through the country side to the restaurant “Son Floriana” near Cala Bona where a truly excellent meal was enjoyed by all! The winner of the event was Jurgen Wolfgarten and his co driver Helga Van Deijzen, 2nd was HP & Karin Escher and 3rd was Peter & Jackie Roach. Our sincere thanks goes to Jean Pierre for providing an alternative to our normal style of rallies, which was both interesting, very entertaining and for choosing such an excellent venue for the lunch! In closing, please remember our AGM will take place on the 26th April, venue will be announced later.